The Orange Micro Crush PiX Series CR3 amplifier has all the cool looks of its bigger brothers. But it's not just cool looking. 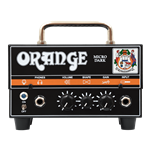 Plug into the little Orange Micro Crush amp, and you'll soon realize it is Orange through and through. Orange gives the Micro Crush amp the brand's signature Orange Tolex cover and woven speaker grille and, of course, Orange's picture-frame edge style. The first thing you notice about Orange Crush amplifiers is their cool looks. Just like its bigger brothers, the Orange Crush PiX CR12L amplifier has the legendary Orange basket weave Tolex, woven speaker grille, beading and legendary hieroglyphs (PiX) and of course the Orange signature 'picture frame' edging. But it's not just cool looks—plug into this great little Orange Crush amp and you'll soon realize it is Orange through and through. Killer Orange tone doesn't have to come from massive rigs. The PPC108 guitar speaker cabinet clocks in at just over 10" across. Designed to be coupled with the Orange Micro Dark guitar amp head, the PPC108 houses a specially designed 8" speaker for punchy tone. Orange employed the same rugged construction techniques they use on larger Orange cabinets, including the same cool black Tolex, basketweave grille cloth, crest, and badge to identify this cab as distinctly part of Orange's Terror line. 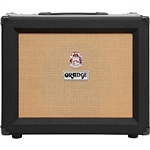 If you have the Orange Micro Dark head, then you need the Orange PPC108 guitar speaker cabinet. An update of Orange's popular Crush Pix bass combo amplifiers, the Orange Crush Bass 25 injects excitement into your practice sessions. Loaded with features from their higher-end OB1 and 4 Stroke amps, Orange infused the Crush Bass 25 with lots of sound-shaping power, courtesy of an active EQ and parametric mid control. A ported cabinet imbues this 25-watt powerhouse with ample low end. All-analog circuitry reproduces the classic warmth favored by such iconic bassists as Geddy Lee, John McVie, and Glenn Hughes. The Orange Crush Bass 25 bass combo amplifier - who knew that jamming in your apartment or dorm room could be so much fun? The Orange Crush CR120C is a 120W solid-state combo made from 18mm ply and loaded with two 12″ 60W, 16 Ohm Voice of the World speakers. The Voice of the Worlds combined with the analogue solid-state circulatory gives the CR120C the tonal clarity and definition players adore in an Orange amplifier. The Crush CR120C combo amp is part of the Crush range, marking Orange's first foray into the world of high power, solid-state amplifiers. Orange have spent years creating a solid-state amp they could be proud of. The Orange team wanted to keep these amp simple. The dirty channel uses a circuit based on four stages of gain and a three band EQ which provides the player with a wide pallet of over-driven and distorted sounds. The clean channel is based on a two stage, two band EQ design, that gives the player a clean but warm sound which when cranked begins to break up. These amps have a transparent effects loop, allowing you to plug in your favorite pedals. It also contains a digital reverb that provides a natural sounding spring, hall or plate reverb. The Crush CR120C features Orange basket-weave Tolex, woven speaker grille, beading, hieroglyphs, and of course the Orange signature picture frame edging. The Orange OBC212 bass cabinet sounds great and can handle high wattage. Made from 13-ply high-density 18mm birch plywood, the OBC212 is designed to handle the low end at any gig. With its dual 12" Eminence speakers, the OBC212 not only produces fat bass tone, but it can also handle up to 600 watts. Internally, the enclosure is acoustically compartmented for strength and vibration resistance. The OBC212 is also slot-ported, allowing for speaker self-correction.